Every April 7th since 1950, World Health Day has been recognized by people and organizations around the world. In particular, the World Health Organization (WHO) has traditionally celebrated World Health Day by drawing attention to an important health-related subject every year. A few health-related themes the WHO has used in the past include: “Save lives, make hospitals safe in emergencies”, “Invest in health, build a safer future”, “Make every mother and child count”, “Road safety” and “Safe blood start with me”. 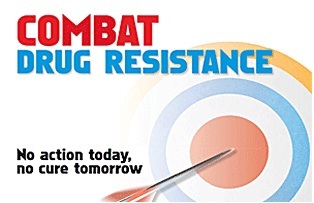 This year, the WHO’s tagline is “Anti-microbial resistance: no action today, no cure tomorrow”. Their goal? To protect our future generations from highly resistant microorganisms that do not respond to regular treatments…which may result in prolonging an illness or even death. How are they going to reach this goal? By spreading awareness and introducing a six-point policy package to important policy makers, public officials and medical industry professionals around the world. This is where we come in. Let’s join forces with the WHO and help spread awareness on combating drug resistance! Share this post with your friends, link it to your Facebook page, email it out…anything! Because like the WHO says, “No action today, no cure tomorrow.” So let’s start spreading the news.